The Long March is a 45 minute video art installation inspired by the history, culture, people, and places of Alabama. A team of contemporary artists assembled hundreds of images and videos culled from Alabama Archives, in addition to original material, to create this digital collage. 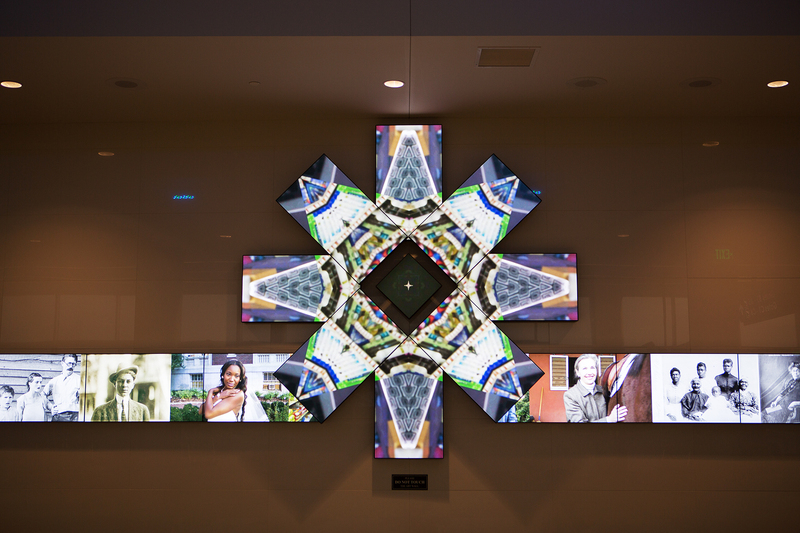 The row of videos combines a rich collection of historical and contemporary imagery and winds into a colorful kaleidoscope to form the shape of a Camellia -- the Alabama state flower. Travelers who encounter this piece might envision themselves as a part of an ever-changing mosaic that is symbolized through Alabama's relationship to 'the march' as a form of social progress. A dynamic visual history is celebrated in imagery that marches from right and left lines into the kaleidoscope to meet and be remixed into a breathtaking depiction of Alabama.